Our one week cycling adventure rolls through the south eastern region of Italy known as Apulia (Puglia), the heel tip of Italy. It’s bordered by the Adriatic Sea on the east and the Ionian Sea to the southeast. The area is characterized by endless olive groves, long fields of grain and vineyards. The tour begins in Matera, a town known for its ‘Sassi’ dwellings built directly into ravines and gullies. The following days pass through 16thC. villages, such as Taranto, Gallipoli, and Santa Maria di Leuca. The coastal routes ride by tiny lakes, lush trees, and along cobblestone pathways. There are plenty of churches, ancient walls, and architectural delights to marvel at along the way. Biking is generally in the lowlands along paved roads with minimal traffic and along beautiful stretches of seaside. There are some hilly areas that aren’t too steep. We offer departures except for the hot summer months of July and August. 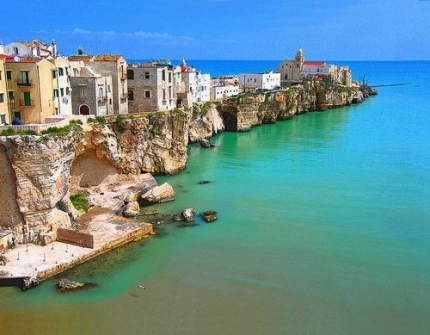 Apulia is an area unspoiled by modern tourism and still maintaining its ancient culture!